After graduating from Savannah College of Art and Design with an Illustration major / painting minor, she started her first job with Carter's/Osh-Gosh kids clothing as a technical/creative artist in Atlanta. After 4 years, she gave in to wanderlust and moved to San Diego and found her place with Free People in visual display/creative merchandising. She was able to work with URBN Inc. where she learned the value of compelling creativity in a brand. Constant soul searching started to eat away at her and she jumped. Jenny has grown Living Pattern as a way to connect herself and her audience to the still delicateness of nature and to themselves. For her, it is a learning process that changes day by day. Find more of Jenny's work by checking out her Instagram and livingpattern.net. 1. The internet is an ever growing fixture in many artist’s lives and businesses, could you talk about the role the internet plays in your artistic and professional life? The internet is a vessel to share my work and process. It's allowed me to make friends with some of the most interesting people that I never would have otherwise. I love the radical openness that exists online. It's an amazing sharing economy of ideas, information and things that accelerates the evolution of my work. How else could I have such immediate access to so much subject matter and so many people to share the results with. It's been the ultimate catalyst. My inspiration comes from every medium I can find. I keep a collection of plants and I love them very much. I always consider drawing from life the best but there is not substitute for a Google image search to find new species and even compositions. I've also collected beautiful plant encyclopedias and botanical almanacs that I use to explore a genus as a whole or helps me with species identification. I also encourage followers to use #livingpattern to tag plant photos or whatever else they interpret it to mean. This brings a whole new dimension to my work as it creates a feedback loop with my audience to inform my future direction. 3. Sites like Pinterest and Instagram are popular places for artists’ to share their own work. They also act as public visual archives, often leading to creative work by others that walks the line between ‘inspiration’ and ‘infringement.’ Have you encountered copies of your work online and does it affect you? If so, what are your strategies for dealing with it? Yes, I absolutely encountered that to all degrees. A company in Chile makes a living on ripping off art. A customer of mine at a South American craft fair sent me a picture of my Monstera and Lacy Tree hanging their a booth and I recognized several other artists work upon further investigation. Other artists made slightly less blatant copies of my work and called it their own but what affected me the most was when the pieces were in concert with other elements of my brand voice, such as photography, desk styling and wording. I believe in the saying "a good artist copies, a great artist steals," but steal from everyone in your work. I took inspiration from Christopher Marley and nineteenth century botanical illustration but it's the blend of these things that makes it unique and my own. A strategy to deal with it recently has been a focus on intricacy and detail. My two new blooming cactus prints are an example of that but there is some really complex work on the docket. On the bright side of this, my work has inspired lots of weekend projects and fun experiments for people. I love to get tagged by people showing me renderings of my monstera, ferns, etc. If I can be the reason that someone get a little more use out of their paintbrushes, it's my privilege to share! My advice would be to be extremely critical of what you put in front of people. Be particular on how you want things to look and it something feels off, keep pushing to get it to where you want it. A simple photograph takes me hours to get, which leads me into another piece of advice: learn photography. If you're a doing food, art, music, events, craftwork, products or anything, compelling images are key. Absolutely. Design Sponge has always been the godmother of cutting edge aesthetic to me. A Beautiful Mess, The Junglow and Dabito are other accounts my thumb is always inclined to double tap, as well. My retailers have some amazing account too. Rare Device, Room6deepcove, Shop Miroja, Fern Shop Cincinnati and Botanic and Luxe are just a few. 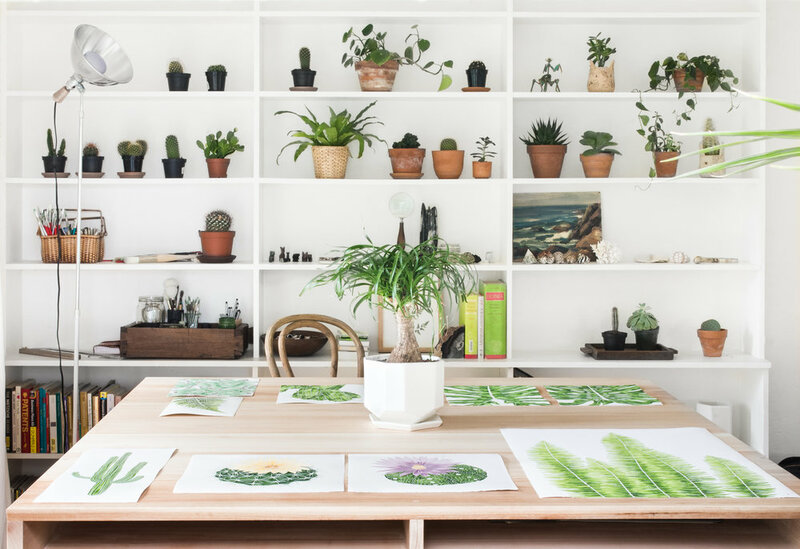 House Plant Journal is a great source of plant knowledge and time-lapsed plant photography. Michelle Morin and I shared the bond having our art plagiarized by the company I mention above - her work is amazing. I love the jewelry of Alexis Russell Jewelry and Bearand the Adelaide and the recipes of Minimalist Baker. If there is one artist you should check out tho, its Baotpham.